Come Worship by the Lake! Come join Trinity at our All Church Day Retreat on Sunday, September 2nd (Labor Day Weekend) at 10:00 AM. Church services will be held at Camp Gwinwood at Lake Hicks in Lacey, followed by a hot lunch prepared by the camp staff. Then spend the day in playing games, enjoying water sports and the large, flat playing field, eating good food, laughing with others and celebrating the goodness of God's creation. 1:00 pm Free Time Activities: canoeing, swimming, volleyball, hiking trails, softball, soccer, bring your own inflatables for the water! The only cost for the retreat is the cost of the meals, which must be Pre-Paid. You may bring a picnic lunch & dinner and eat on the grounds or you can pay for camp meals. Kids six and under eat free (that's the good news!). Everyone else is $11/lunch and $12/dinner. 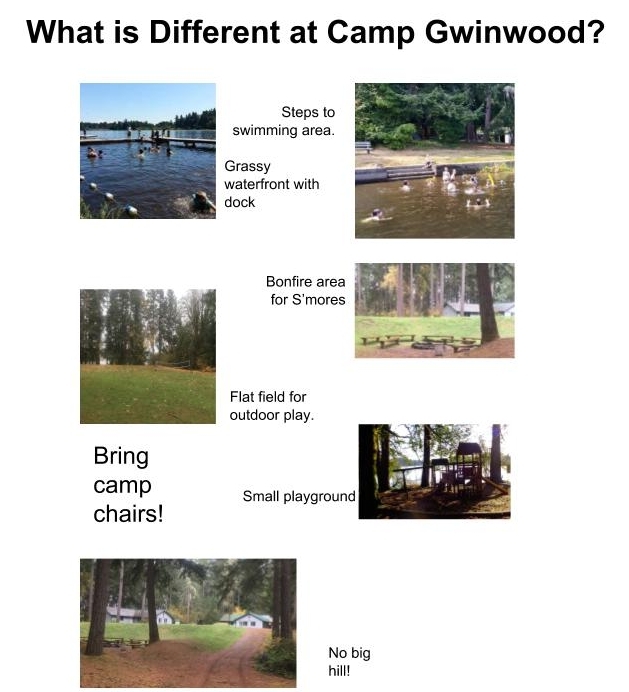 For Directions to Camp Gwinwood, see their website by clicking here. The Camp is located 28 miles south of Tacoma in Lacey and the driving time is 30 - 45 minutes. Call the church office to arrange a ride or carpool, if you need help with transportation. Trinity Goes to the Rainiers!